Why trap sparrows? The English House sparrow is a non-native, invasive species imported from England in the mid 1800s. As invasive species, the English House Sparrow, as well as the European Starling and Pigeon are NOT protected by the laws that protect our native birds. Disposition of the House Sparrow and the Starling is not only legal, but in many cases encouraged. Like many other invasive species, it has had a dramatic impact on the ecology where it has thrived. And it has thrived most everywhere it’s been introduced. The House Sparrow is a very hardy species and does well in nearly any area and climate. It is especially adaptable to human activity and does well anywhere it finds a source of food. From livestock feed and spilled grain on farms, to restaurant garbage in urban areas, to the yards of suburban bird feeders who buy cheap birdseed that is nothing but junk. By junk, I mean inexpensive seed that is attractive to House Sparrows, but not to native birds. 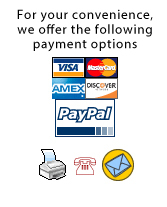 Unfortunately, because price alone seems to be the deciding factor for many people buying birdseed, much of the birdseed sold today is just that, house sparrow food. This “winged rat” is now prevalent throughout the continent where it not only competes with the native birds, but spreads livestock diseases, avian lice, destroys crops, and makes a general dirty mess wherever it congregates. In these places bacteria, fungal agents and parasites in the feces may also pose a health risk. Even though I was well aware of just how destructive the HOSP is, I have been taken aback by the number of stories I have heard from people since putting up this site. It pains me when I think of the huge numbers of natives that are being violently killed by this introduced species year after year. Please, if you want to host native cavity nesters like the bluebird, chickadee, and martin, be a responsible landlord and eliminate the HOSP before they eliminate your natives. There is nothing more heartbreaking than to go check a nest box you’ve so carefully placed, maintained, and monitored only to find destroyed eggs, dead native nestlings or a dying native adult due to a HOSP attack. Please remember! 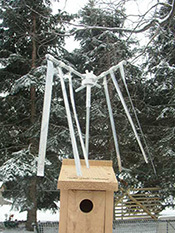 In using any bird trap, it is imperative that the trap be monitored at least once daily so that any native species can be immediately released, and that House Sparrows to be kept as decoys are provided a source of food and water. There are several species of sparrows native to North America as well. While the male House Sparrow is quite distinctive and easy to identify, the female may be harder to identify. Please get a field guide to assist in your identification. And if there’s any doubt, let it out! 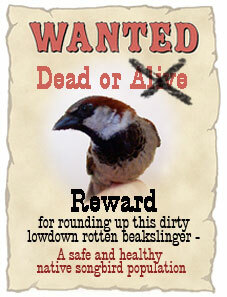 It is much better to mistakenly allow a House Sparrow to live another day than to mistakenly destroy a native bird!